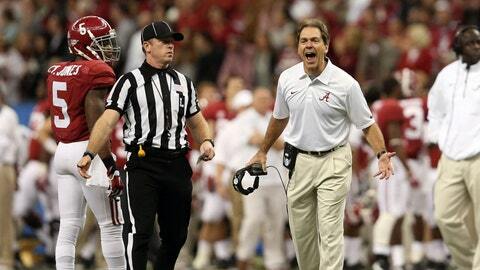 Alabama Crimson Tide head coach Nick Saban yells in the second half against the Oklahoma Sooners at the Mercedes-Benz Superdome. Oklahoma defeated Alabama 45-31. Alabama always seems to have locker room material to motivate the team. Despite winning the 2012 national championship, the Crimson Tide had the season’s lone loss to Texas A&M on replay along with the Aggie logo on various weight stations. After a sour finish to the 2013 season, ‘Bama has a new sign in the locker room. The Crimson Tide lost a thriller to Auburn that cost them a shot at the SEC and BCS championship. The back-to-back defeats will sting all offseason, and coach Nick Saban is making sure his team doesn’t forget how it feels.